So I admit I tried to get some help writing this blog. Cheat perhaps. I asked my daughters to write some installments. What a great writing exercise for them, I thought. What an opportunity. One they will thank me for. My twelve-year old daughter perked right up at the request. "I can write about that really uncomfortable saddle you make me ride in," she said. "What!" I replied, slightly defensive. "I rode at Ledyard in that saddle!" "Yeah, Sylvia," piped up my fourteen-year old daughter Susanna, "You're riding in a piece of history." History? This was not going in a direction I hoped and it was certainly not going to help me sell tack. "Or," continued Sylvia, "How about the time you didn't tighten my girth and the saddle rolled around and I fell on the driveway." Definitely not going as planned. Now not only do I have bad tack but I am also a bad parent. "You were five," I responded. "You can't possibly remember that." So while my daughters ride in discomfort in my cherished Stubben Siegfried, I ride on air in my Bates Elevation Next Generation Saddle—with a breastplate because I am not good about remembering to tighten my girth. Although I had long appreciated the qualities of the Bates saddles, I was not fully converted until recently. 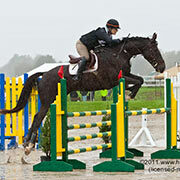 I loved riding in the blue-seated Barnsby Xtreem jump saddle. I loved the feel of the horse under my leg and the responsiveness of the carbon tree. And my horse did turn quick on landings, a little too quick, and I thought maybe a saddle with more to it would give me a little more security. And since I was about to head to tradeshow and meet Ron Bates, maybe I would try his saddle. I supported the idea of the CAIR panels and the adjustable head plate: how kind to the horse's back, how it fit a range of horses. As a retailer, it had solved many a saddle-fitting dilemma for me. So I came home from work with a Bates saddle. After only twenty minutes and a few verticals, the change in my horse and myself was surprising. I didn't even realize how tight my horse was on landing until he relaxed under the CAIR system of this saddle. As soon as he relaxed, I too was a quieter and a more secure rider. It was obvious that the tension eased as a result of the air panels on his back. I found that the air provided some absorption for the rider as well, much the way the springs in the front frame of a mountain bike ease the tension on the shoulder by taking up shock, the CAIR panels assist the seat in reducing impact on the rider body as well. Ease of rider movement and freedom for the horse made it an easy decision to switch both my competition horses to saddles with the CAIR System for jumping and for dressage. Impressed by Isabell Werth's commitment to the Wintec saddles, I decided there were benefits to riding my own horses in the lightweight synthetic saddle. Weather in Vermont is temperamental and my tight schedule offers little latitude, so synthetic was an easy care choice for bad weather and poor tack cleaning routine. I was happy to have such a light saddle to carry down to indoor in the winter and my horse's responded well: shoulders opened, backs swung, strides adjusted quickly to my seat aid. Why spend more when my performance would not be less? And if the multi-medalled Isabell can ride at the World Equestrian Games in a Wintec, I think I can ride at my local dressage shows and horse trials in one. 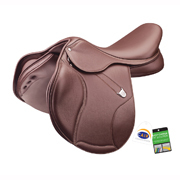 Saddles have improved over time with innovations for better fit and a better ride. Bates and Wintec saddles offer a range of options for a precise fit: CAIR panels that conform to the shape of your horse, shims to further tailor fit, a gullet system to adjust the head plate, and a girth point system. Girth up your saddle and in twenty minutes, the air conforms to your horse. Horses change depending on maturity, type of work, and fitness level. I like how this saddle responds to those changes. The consistent balance and the fluidity of the air will allow muscle development and keep me even to work on my position to be a more effective rider. Maybe soon I will put my daughters in the Bates saddles, and because of their history, I am sure they will appreciate the comfort of the ride. Maybe even thank me for it.